Jugglers, dancers and acrobats... plus fire! 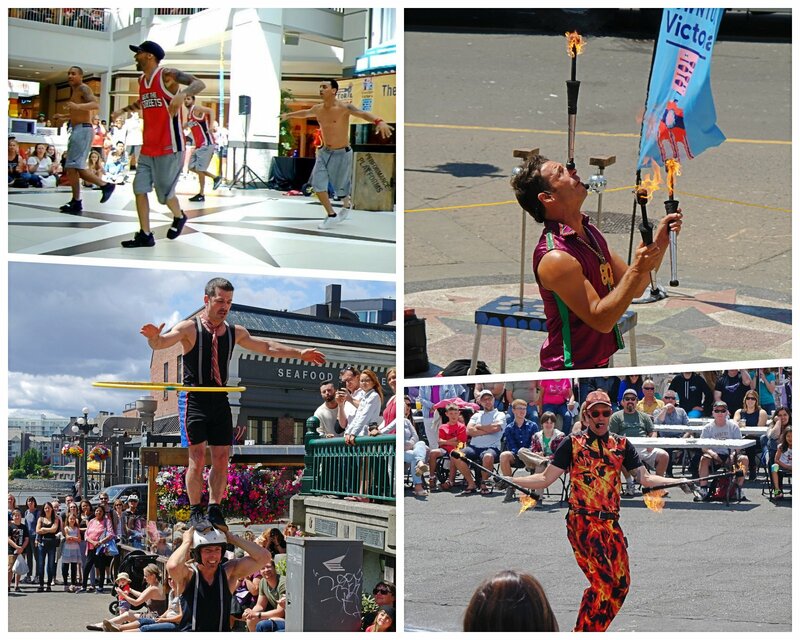 Last weekend the six day Victoria Buskers Festival wrapped up. We saw about six acts, including long-time returning favourites Les Vitamines (above lower left). There was some controversy over the event this year. In past years, it was a two-week long event with many more acts spread out over the main harbour waterfront. However, the organizer of that event had some sort of falling out with his business sponsors and Victoria city which led to his festival leaving town and re-locating to the interior city of Kamloops. It won't be back. Instead the city and businesses threw their weight behind a new scaled-down event. It definitely wasn't of the same calibre of previous events. There were fewer acts, spread out over venues that were separated by a few blocks, forcing you to hussle from one show to the next to see the good acts. Nor were the chosen venues physically ideal for crowds of spectators.